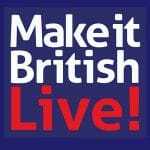 We are pleased to announce that Roaches International will be exhibiting at “Make it British – LIVE!” in London from 29-30 May at London Business Design Centre. We will be located at stand G18. It is an honour for Roaches International to be part of the exhibition and to promote the “British is Best” tag line.